Low Cholesterol Healthy Breakfast Recipes, Indian Low Cholesterol Breakfast Recipes. Breakfast as we all know is definitely the first and quite important meal of the day. It is quite often made unhealthy by the addition of processed foods like white bread, butter, cheese, refined semolina etc. These are either refined, so devoid of fiber, or are rich in trans fats. Both of these are not cholesterol friendly and hence better avoided. Healthy additions for morning meal as a low cholesterol option would be whole grains, oats, sprouts, low fat curds, fresh fruits and egg whites. There is the option for Thalipeeth which is made from 3 healthy flours and mixed vegetables or Mahrashtrain Pilta which are healthy and can be eaten with a bowl of low fat curds or whole wheat bhakri. There is the famous Zunka recipe which is a dry version of pitla and made of besan which is cholesterol friendly. We all love dosas in India and its a staple breakfast, snack or dinner. However, the traditional dosa is made from rice and urad dal and hence not very healthy as rice is a simple carbohydrate. Opt for the easy and fast buckwheat dosa made from buckwheat which is high in fibre, diabetic friendly and good food for pregnant women. Oats is rich in soluble fibre, which helps lower blood LDL cholesterol, the so-called "Bad" cholesterol. Soluble fibre absorbs water and swells and to become gel like substance which helps in the absorption of nutrients like B Vitamins and minerals like Magnesium and Zinc which are key to a good heart. So enjoy the super heathy oats mutter dosa recipe. There are alos the 4 flour dosa and moong dal dosa to enjoy. We have a good selection of juices without the usage of sugar and full fat curds. Carrots relieve constipation, lower blood pressure, have fibre and lower cholesterol. So have carrot and red pepper juice or the carrot and spinach juice. You can drop the traditional rava upma and replace it with Broken Wheat Upma, oats upma or quinoa upma which are all high in fiber and healthy for you. This section explains in brief the way to use these ingredients to make a hearty low cholesterol breakfast. Vegetable Oats Pancake, Sprouts Dhokla, Jowar and Vegetable Porridge and Parsley Yogurt Spread are a few other healthy choices for those looking to keep a check on their blood cholesterol levels. Apart from being healthy, these innovative recipes are really tongue tickling to be enjoyed as first meal of the day. Just a wee bit of modifications in the choice of ingredients can bring your favourite dish on the table - the low cholesterol way. 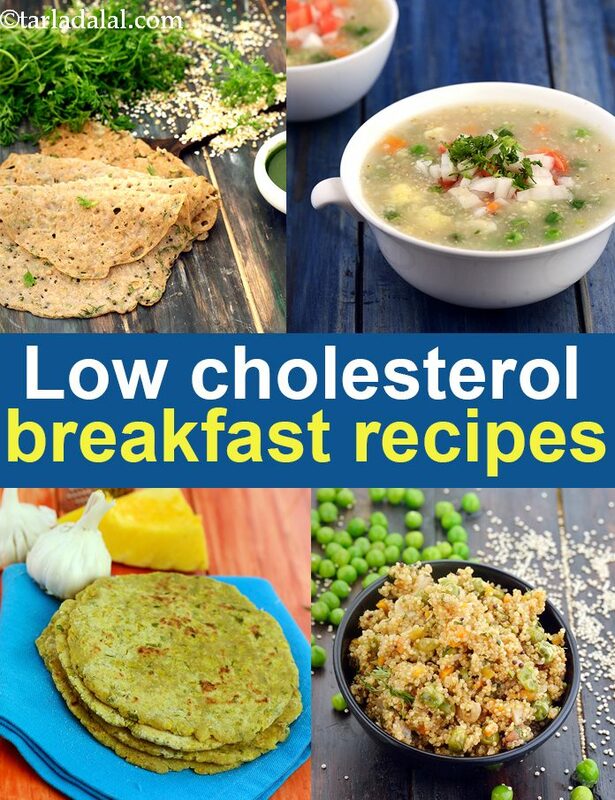 Enjoy our Low Cholesterol Healthy Breakfast Recipes, Indian Low Cholesterol Breakfast Recipes and other low cholesterol articles below.